I am asking because I want to make sauce, and I have only a few ripe tomatoes, but the rest aren't ripe enough yet (just turning orange). And I need more at a time. Is it better to pick the fully ripe ones and bring them inside and wait for the others to become ripe? How long will the picked ones last? Or is it better to keep them ripe on the vine? How long will they last before they start to go bad? The tomatoes I pick that are ripe will go in the fridge if not used right away and they will keep for a week or more that way. I don't like keeping them ripe on the vine due to pests and if there's a few days of hard rain, the tomato may split due to the sudden increase in moisture uptake by the plant. 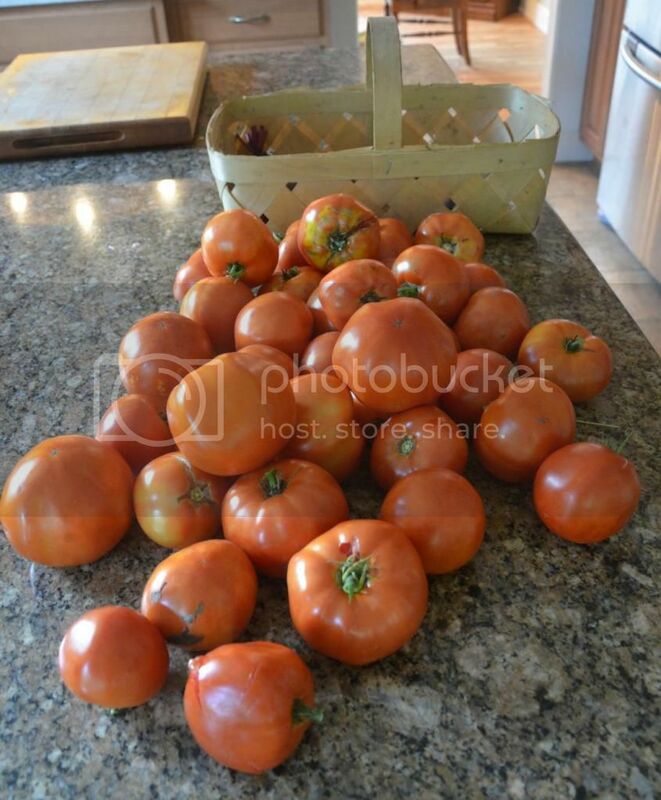 I would suggest you either grow more tomato plants if you plan on canning or use determinate type tomatoes that come ripe just about all at the same time. Those clusters of ripe tomatoes you see at the market are determinate type and that is why they are all red and ripe in the cluster like you see them. Romas will stay ripe without getting bad for weeks even in the garden. A long keeper tomato also last but most tomatoes go bad fast. keep them cool will make them last longer with air circulation. ! If you are going the sauce route. I would say wash cut out the core and freeze them. Than when you have enough thaw them out and you are ready to go. Storing in the fridge is an idea. but for fresh tomatoes it is not adivasble. When tomatoes are stored in the fridge the cool temps break down the enzymes that give them there flavor. They get soft as well, freezing is a better alternative but again not for fresh in my mind. I you decide to freeze them and need to skin them put them under warm water after thawed and the skins come right off. If you have a food mill than that is unecceasary. gixxerific wrote: If you are going the sauce route. I would say wash cut out the core and freeze them. I think this is optimum for any produce destined to be cooked -- wash pre-prep and freeze. Choose freezer bag size depending on how much you'll cook at a time/size of pot. I like freezing in 1 gal bags or qt bags. Weigh them and mark on the bag along with date and variety of tomato. If I have the opposite problem of having too many ripe tomatoes, I will try to cut out the stem end and freeze whole or, when desperate, just remove the green calyx and toss them in bag whole (only "perfect" tomatoes). 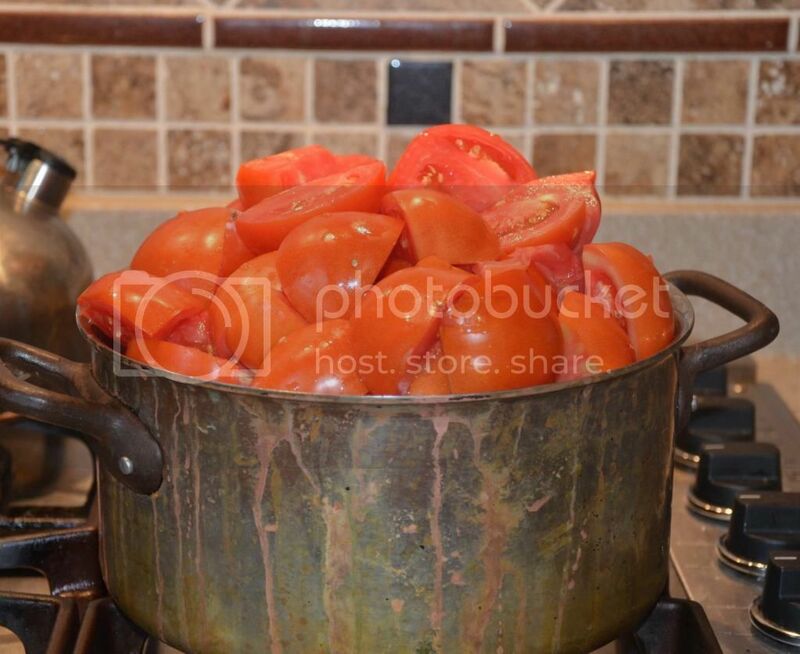 If you freeze cut up tomatoes in a big bag -- 1gal or 2 gal in a relativey flat layer (on a cookie sheet or casserole pan), it saves freezer space and you can break off portions as needed for adding to sauteed pasta sauce, stir fry, fried rice, etc. This works well with whole frozen cherry tomatoes as well. I think Gixx implied that he would defrost them first, then run them through the food mill? I just "clunk" the frozen mass in a pot, cover and put on the stove on low heat and go away until they defrost and start bubbling. THEN I strain the juice into a separate container first and then food mill to remove seeds and skin. 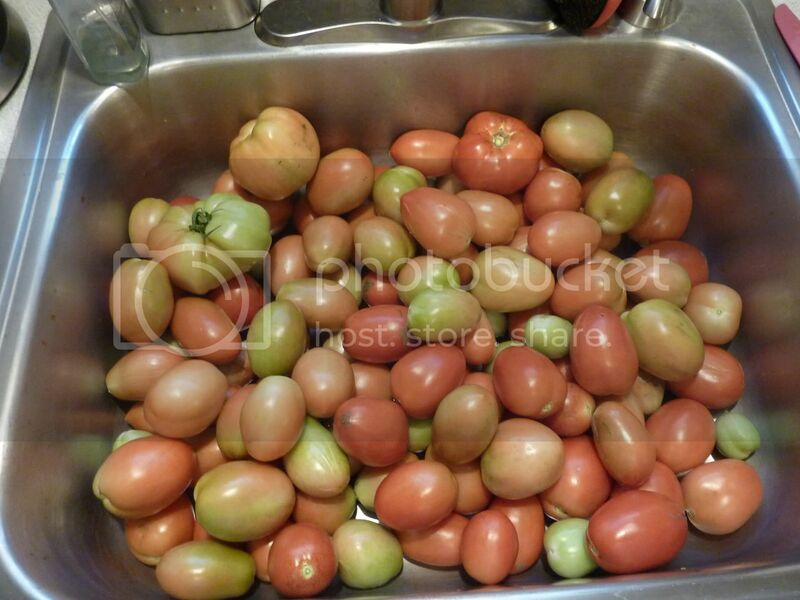 I used to face the same dilemna about accumulating enough tomatoes to make a batch of sauce. My answer to that was to grow LOTS and LOTS of plants, and now I am saucing EVERY DAY as a result of harvesting 15 -20 lbs. each day for the past 3 weeks straight. 212 lbs. harvested so far this year and pureed, boiled down to 22 quarts of sauce in the freezer. I expect to easily hit the 300 pound mark by season's end. Thanks for all the replies! I have 6 Roma tomato plants and 1 Delicious tomato plant (which I will not plant again next year, not worth it for the sauce, which is all I do, well, besides salsa), and so far I had already made a batch of sauce with 10 pounds of tomatoes, which I am sure you can guess comes out to like 2 meals worth. I was hoping the rest would all turn at the same time, but no such luck. From all the comments/suggestions, I have decided to leave the ripe ones on there and see what happens. Tonight I am picking whatever is ripe or semi ripe and am taking the day off of work tomorrow to make sauce! I am praying there is like at least 20 pounds out there this time, but I don't know. I might have to just throw in some green ones. After this batch, I will probably be able to do one more. That's enough for me! I can't keep taking time off from work to do this! SLC I am going to hook you up with at least 2 differant variety's to play with next year. They are good for saucing, I have some garden work to do now but will get to it later. I will let you know in our Pm's. I did six Early Girl and six SuperSonic this year. waiting for enough ripe tomatoes to sauce down is not my problem . . .
and fortunately, the SuperSonics are later than the Early Girls, staggering the ripening issue. to your question, leaving them on the vine to ripen to the slightly soft state means they'll rather quickly run thru ripe to "heading for fermenting" on the counter. I would pick them slightly under-ripe and accumulate. slightly under-ripe / green in a sauce is not really an issue I can detect. I read all the replies and forgot the poster's name that asked how many plants I have. The answer is " 45 " . I just had my best day of the year, today, with a harvest total of 23 lbs and a season total so far of 235 lbs. To the poster who needs to take days off from work to make sauce, REALLY ??? I do it after work, and although it keeps me up late, I consider it a part-time job, and still make it to work on-time the next day. I have been a saucing fool for the past 3 weeks. Thanx gixxerific! Now I can't wait til next spring! Well, here's my 2nd harvest. I fought all the spiders <shudders> and bugs, and after letting out quite a few loud yelps here and there cuz a bug was on me or something, I pulled everything that had some kind of orange on it. As you can see, I've got some red, some green (cuz they fell off while I was picking another one) and a lot of orange. I sure hope my sauce comes out right!!! I weighed it, and it's just over 20 pounds. There's probably another 40 pounds left out there. I hope the rest don't turn until I get back from vacation! 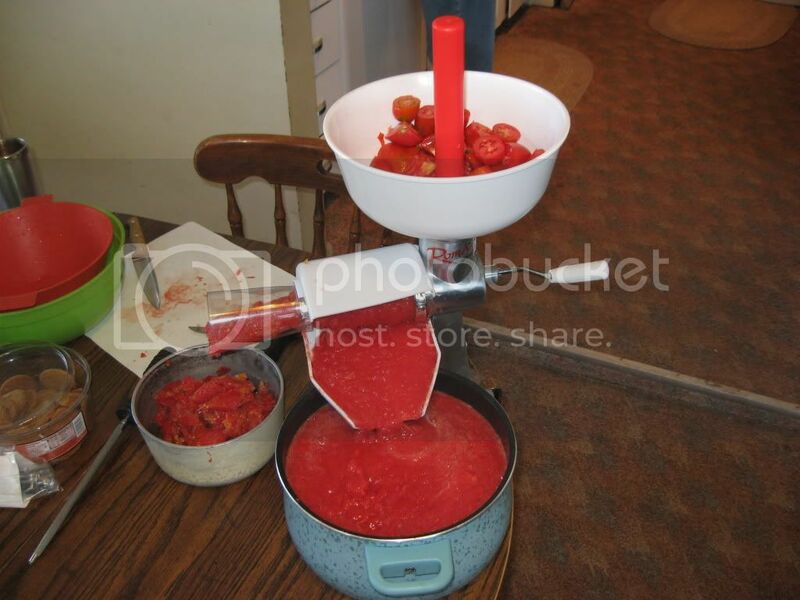 get a tomato mill even a cheap one cost about 60 bucks worth every penny. takes all the time out of making sauce. SLC wrote: Thanx gixxerific! Now I can't wait til next spring! Sorry I did not know you were doing all that. I don't do anything except cut them into approx. 1 inch cubes with skin on , crush them in the blender and start boiling down. You willl save tons of time that way. I have the same mill dusty has. Works wonders, I did mine a bit differant though and put the toms in the canner till they reached 10 lbs remove weight they blow up when you pull them out and drain them put them through the mill they are just about the right consistancy to can right there. SLC check your pm i need your addy.